Intro to Blues guitar - Eat. Sleep. Guitar. Typically the Blues are played using 7th chords. Here are the first three chord shapes that you to need to memorize. Blues in A is a great place to begin. 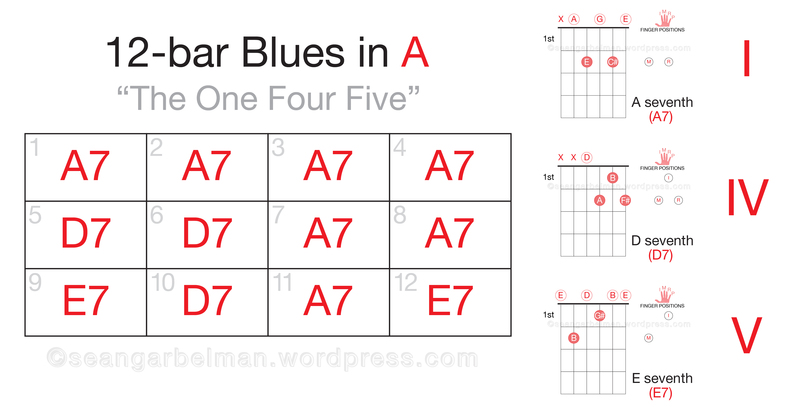 The following Blues are known as the 12-bar Blues and also “The I – IV – V” (The One Four Five). Here is the standard 12-bar Blues in A. Each “bar” gets 4 beats. Now lets change the key to E. You will need to add the following chord shape to your ever-growing chord list. The key of E is also a very popular key for the Blues. 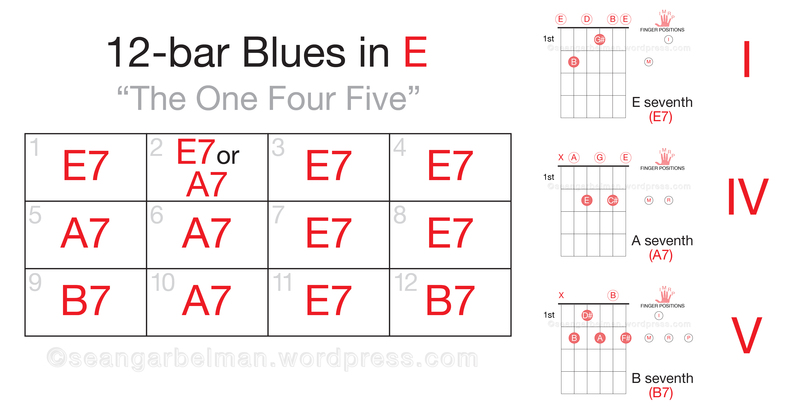 Here is the same 12-bar Blues transposed (the musical term for translated) into the key of E.
Just to keep things interesting I added something new for you at the second bar. Going to the A7 (the IV chord in the key of E) during the second bar helps to break up the monotony. I especially like to outline this chord when I am soloing on the 12-bar Blues, but we will talk about soloing on the Blues later. Now you are ready to learn your first Blues turnaround.